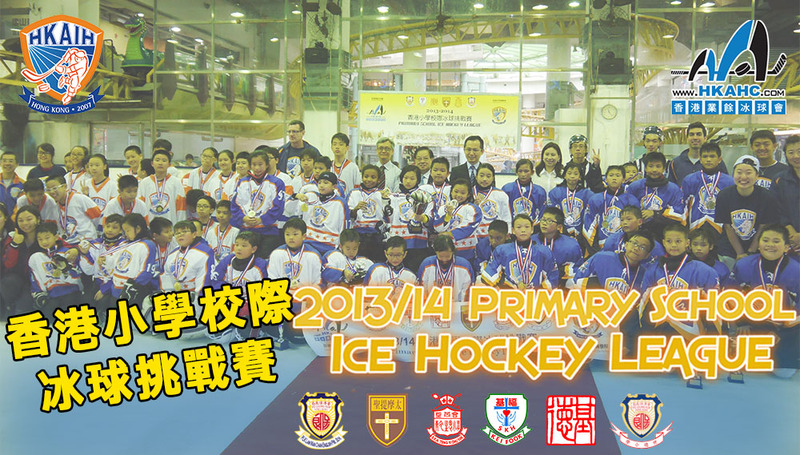 Co-organized by HKAHC and HKAIH, the 2013/14 Hong Kong Primary School Ice Hockey League was successfully completed on July 3rd, 2014 at Sky Rink, Dragon Centre. 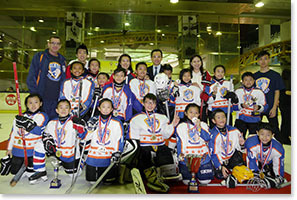 First time participant Po Leung Kuk Lam Man Chan English Primary School took home the gold medal winning by a score of 3-2 against last season’s gold medalist Sheng Kung Hui Kei Fook Primary School. Even though S.K.H. 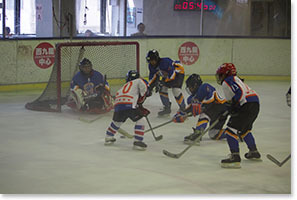 Kei Fook was not able to win the gold medal again this year, the team still put up a good game against their opponent. The best player awards went to Lee Pui Lam of PLK Lam Man Chan and Law Tin Ching of S.K.H. Kei Fook. Goalie Lai Chi Ngai from S.K.H. Kei Fook was awarded as the MVP, congratulations to all award winners. 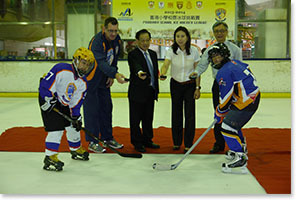 The drop puck ceremony was attended by Mr. Barry Beck, General Manager Coach of Hong Kong Academy of Ice Hockey, Mr. Tse Chang Keung, Chief Administrator of Anglican (Hong Kong) Primary Schools Council Limited, Ms. Man Sze Wing, Principal of Po Leung Kuk Lam Man Chan English Primary School and Mr. Chan Chi Wing, Principal of S.K.H. Kei Fook Primary School, along with the two team captains of the Championship game. 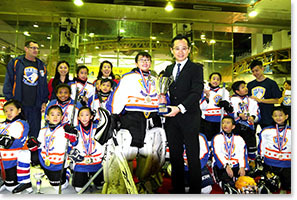 Mr. Thomas Wu, Chairman of Hong Kong Academy of Ice Hockey and Hong Kong Amateur Hockey Club, thanked all principals, teachers, parents and players of all participating schools for their unlimited support, in particular Anglican (Hong Kong) Primary Schools Council Limited and Po Leung Kuk for their support to the development of Ice Hockey in Hong Kong. 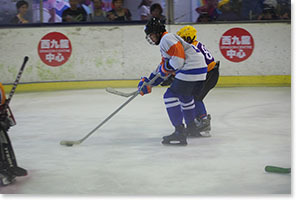 Mr. Thomas Wu hopes that students participating in the school league will be able to strengthen their minds and bodies through playing ice hockey, and also learn team spirit and sportsmanship as well.